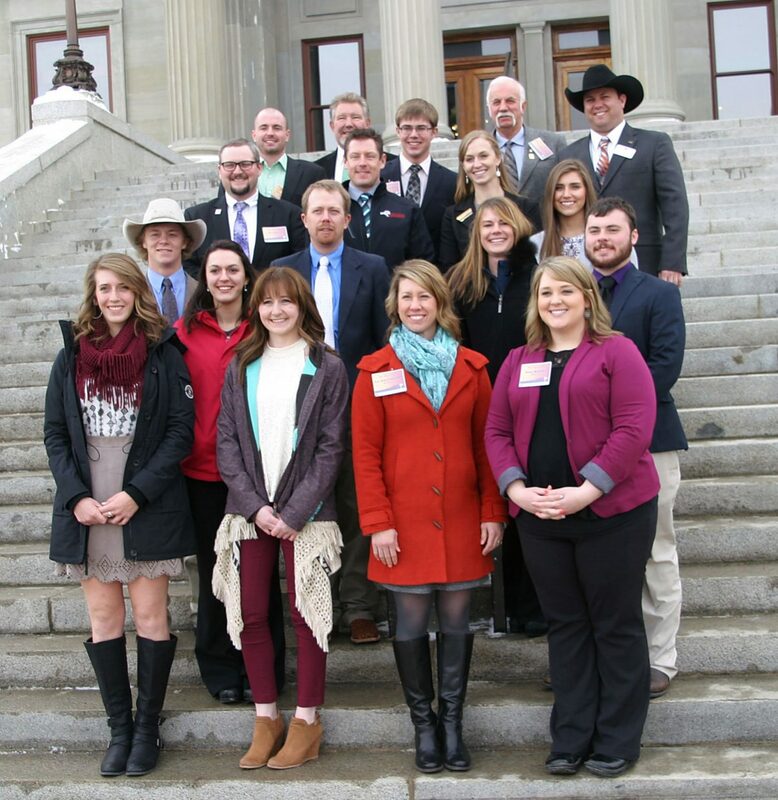 Collegiate Young Farmers and Ranchers from UM-Western and MSU Bozeman, along with members of the MFBF Young Farmers and Ranchers Committee, held their Calling on the Capitol in Helena. Photo courtesy of MFBF. The concept of adding value to Montana agricultural products circulated through meetings during the Montana Farm Bureau Federation (MFBF) Young Farmers and Ranchers (YF&R) Calling on the Capitol Jan. 24-25 in Helena. During visits to the Departments of Livestock and Agriculture, as well as with a visit with Governor Steve Bullock, the talk turned to keeping more agricultural products at home and available to Montanans. "During our meeting with the governor, he addressed value-added agriculture as a smart way for young farmers and ranchers to stay profitable," noted MFBF Young Farmer and Rancher Chair Gil Gasper. "We ship out so much of our raw materials, like peas, that could be processed into, say, pea flour right here in the state. There are a lot of opportunities to develop those ag resources and sell directly back to the consumer." Shay Richter, a young farmer from Fort Benton, noted, "Walt Anseth at the Department of Agriculture explained many ways they are working to get our products overseas, but he also talked about ways to add value to products to keep the money and products in our state. Whether we add value to our beef or to our crops, developing with new ways to produce end-products in state can help young farmers and ranchers." Jenny Stovall, who ranches with her husband near Billings, added, "Many young farmers and ranchers want to stay in agriculture, and what we heard in Helena was that adding value to our agricultural products can help our bottom line. There are many opportunities and the Department of Livestock and Department of Agriculture are very willing to help make ideas for value-added ag products a reality." Calling on the Capitol focused on the importance of becoming involved in the legislative process and the group was impressed with how accessible legislators and all of the elected officials are. In a morning presentation, MFBF lobbyists Chelcie Cremer and Nicole Rolf stressed the importance of contacting your elected officials. 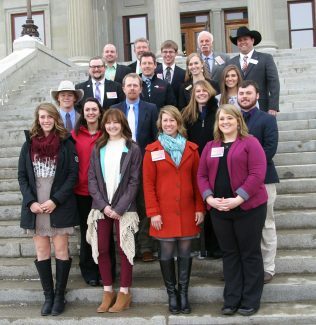 Members of the Collegiate Farm Bureaus at MSU and UM-Western were impressed with the process and the availability of Montana's elected officials. Todd Lackman, a student at Montana State University from Hysham, added, "Calling on the Capitol made me interested in the whole political process. It showed that one person can make an impact." Baylie Johnson, a UM-Western student, noted, "The conversations about agriculture that we had with the governor and the different state agencies has helped me understand what we can do in the future as agricultural producers. It showed how important it is to contact your legislators, as they really do want to hear from you."